Insert Related Elements is a powerful productivity and exploration tool that allows diagrams to be created automatically from relationships that exist in the repository. Typically elements are added to the repository by a number of modelers and no single person will be totally aware of all the elements in the repository and their relationships. 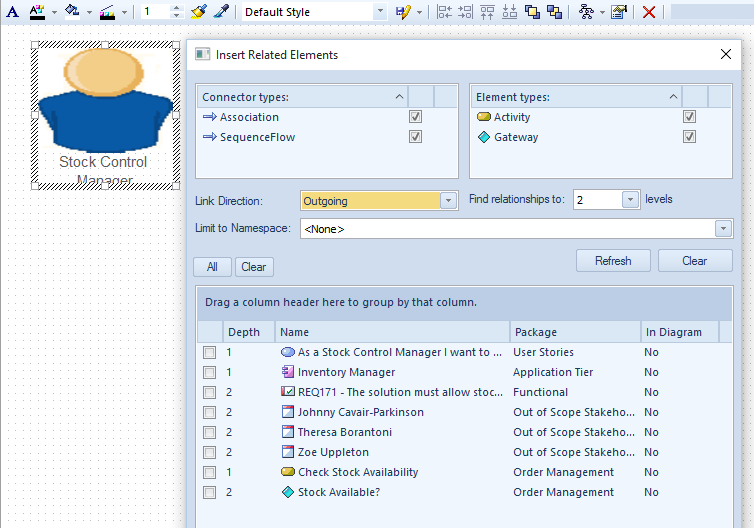 By placing a single element onto a diagram that acts as a context (or starting point) the Insert Related Elements facility can be used to explore the element's connections and to automatically draw a diagram using the context element as a starting point. This will almost seem like magic and powerful and expressive diagrams can be created that a modeler will not have seen before or not thought of creating. 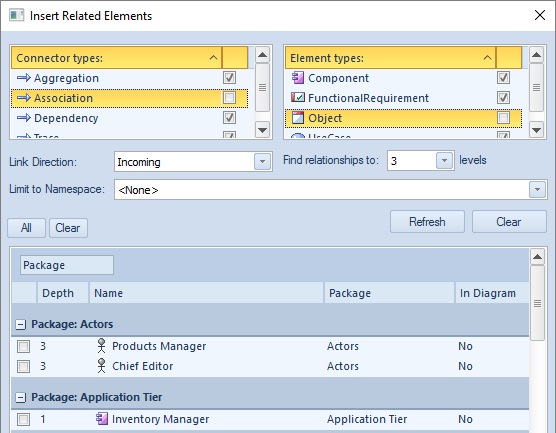 The Insert Related Elements facility can be used to create a diagram automatically from its relationships in the repository, including the relations of the related elements themselves down to a deeper level. It can also be used as a discovery tool where the modeler wants to explore a model (or part of a model) they might not be familiar with. It is also useful in workshops when a number of model authors or other stakeholders are present to show the traceability between different parts of a repository. Insert Related Elements has a flexible interface that allows the modeler to configure what types of relationship to include in the discovery, the direction of those relationships, the types of related elements to be included, the depth of the graph traversal and more. The related elements can be related to a specified namespace, and once a set of related elements has been listed the modeler can choose which elements to insert into the diagram. A depth of 1 will just include the elements directly related to the context element, a depth of 2 will include the directly related elements and any elements directly related to them, and so on up to a depth of 5. There is also the option to allow the tool to layout the diagram after the elements have been inserted.